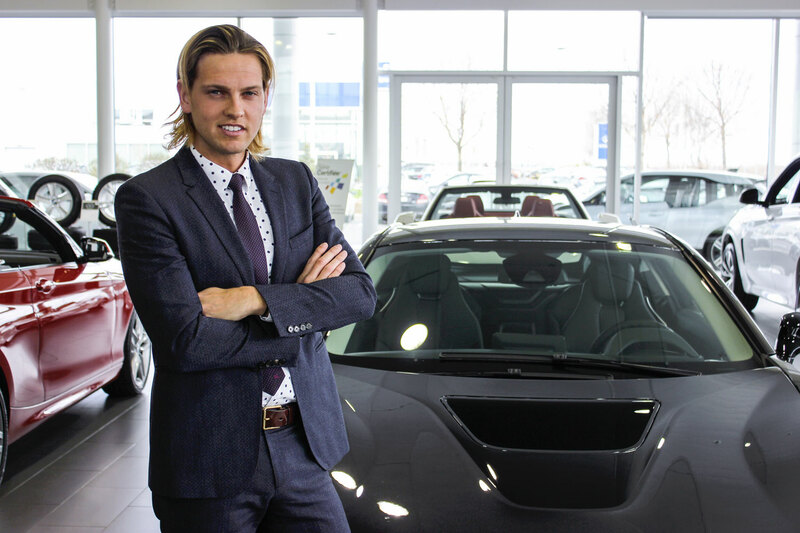 Last May, we met with Clayton Desautels, sales consultant at BMW Sainte-Julie. Following his extensive training, Clayton answers a few questions about the i series, the electrical branch of the famous German manufacturer. What are your favorite aspects of the i8? "Without hesitation, I would say the design! The BMW i8 is simply magnificent! Obviously, opening the butterfly doors adds quite a distinctive character to the car (laughs). Then I would say it would be the engineering of the motorization. The BMW i8 offers an AWD, with a gasoline engine that powers the rear wheels and an electric motor for the front. This combination of engines produces a total of about 350 horsepower. This allows the vehicle to accelerate from 0 to 100 km/h in 4.4 seconds. Surprising for such a lightweight hybrid vehicle…"
"Moreover, the fuel consumption of the i8 is very impressive: the car consumes only 2.1 L/100 km, for the equivalent performance to that of an Audi R8 V8. To give you an idea, the Audi R8 consumes approximately 13 -14 L/100 km. Another interesting aspect that I would like to highlight is its ability to accommodate four passengers. Despite its exotic look that resembles that of a Lamborghini or Ferrari, the two additional seats are definitely a plus. Overall the car is incredible." What are your favorite aspects of the i3? "The look gives an interesting dynamic, that’s for sure. The i3 seems small at first glance, since it only has two doors, but it’s completely false. This little car is impressive regarding its interior space. It can easily accommodate four passengers! Its doors being closed against each other were designed to facilitate the entry and exit for all passengers. In short, the rear space is truly remarkable for a car that looks so small from the outside." "With the batteries installed at the bottom of the vehicle, it handles surprisingly well due to its low center of gravity. The vehicle gives a very interesting dynamic during the winter weather. Also, I love the engine of the i3, a vehicle able to produce no gas emissions. Here’s how it works: the BMW i3 is equipped with a small gasoline engine that only serves to regenerate the electric motor. If we drive the car exclusively on the electric motor, the car emits zero emissions. When the battery is depleted, the gasoline engine takes over to regenerate the load." How would you compare the acceleration of an electric car vs. a gasoline car? "It is not the same thing at all. I must admit that I love the feeling of a gasoline car, but I feel that it’s something more or less necessary for the majority of people today. When we press on the accelerator of a gasoline vehicle, you feel a strong force able to give you goosebumps. The feeling of an electric vehicle is different, obviously, but as impressive. Electrical power is instant and fast. There will certainly be a time of adaptation since the automotive industry is moving towards alternative sources of energy, starting with electricity." How would you compare the i8 and the Tesla Model S? "This is an excellent question that many clients ask us. In fact, there is a big difference between the two vehicles. The Tesla Model S is a vehicle that is certainly more practical for families due to its 4 doors. Tesla is a particularly interesting manufacturer, and they are doing nice things, I must admit. However, do not forget that the company has only existed for a few years, while BMW has been proven successful for over 100 years. The Tesla is an amazing car, but it simply does not compare to driving an i8. The i8 has a replica of a gasoline engine, but is a hybrid. When you drive the i8, it is the complete the opposite of what you might expect. The vehicle is powered by a gasoline engine and that is exactly the feeling that BMW wanted to give sports car fanatics: a sense of power like the one in gasoline-powered vehicles. Producing a 100% electric i8 was not BMW’s objective in the design of the vehicle. Their goal was to have a sports car that follows the green trend of 2016. I think the feeling of driving a sports gasoline-powered car is still present for many sports cars enthusiasts such as the Audi R8, Ferrari or Lamborghini. The targeted customers look for a specific feeling driving these kinds of vehicles. If BMW wanted to make the i8 completely electric, it would have. Will the i8 become completely electric one day? I think that this aspect would satisfy many people; however, I would come and try the vehicle before making any assumptions. I had the chance to drive the Model S and the i8 and I cannot even compare the two vehicles. The feeling of driving is entirely different." The i8 is perceived more as a sports car. Would you say that the i8 is for BMW M enthusiasts who have a green conscience? I realized that there are two types of customers for the i8. The first purchases the i8 as a 4th or 5th car to add to his collection of very sporty vehicles because he finds it esthetically beautiful. The second will be a person with one or more businesses looking for an ecological sports car. It will be a thoughtful purchase to respect the planet while being “trendy”. This client will drive the i8 every day of the week as well as on Saturday if he wants to have fun and go out for dinner. To answer your question more specifically, a client who is interested in the M series purchases by pure emotion. While the client who is interested in the i8 purchases based on 80% emotions and 20% environmental awareness." It's really refreshing to see a company taking a green car initiative; in your opinion do you think the rest of the industry is falling behind? "I would not say that. There are many beautiful things presently happening in the automotive industry. I would say the question is rather: “Will the other manufacturers be able to follow BMW over the years?” The answer is no, I think not. Just like all of BMW’s models since its beginnings. Each manufacturer has its ups and downs, but BMW has never had a severe drop like numerous competitors. There are many manufacturers who watch carefully what BMW develops and then try to do the same. BMW is a company that innovates tremendously year after year." Can we assume that BMW's future will come from hybrid and electric technologies? "Oh yes, definitely. I have been saying it for a long time. In 10 to 15 years, gasoline will be a thing of the past, that’s for sure." A few weeks ago, this couple visited BMW Sainte-Julie and fell in love with the BMW i Series.